Ensure that consideration for safe cycling routes and Complete Streets are included in all local planning changes. Fully implement the Toronto Bike Plan’s bike lanes and routes in Ward 29. We hold organizational and social meetings every twice monthly, usually in a local cafe, restaurant, or pub. Our meetings are informal and are open to any interested members of the public. We occasionally invite guests from the City of Toronto, other ward-based groups, and other advocacy organizations to lend their expertise, ideas, and experience. If you’d like to attend any of our meetings, please check the calendar for the next meeting time or contact us. 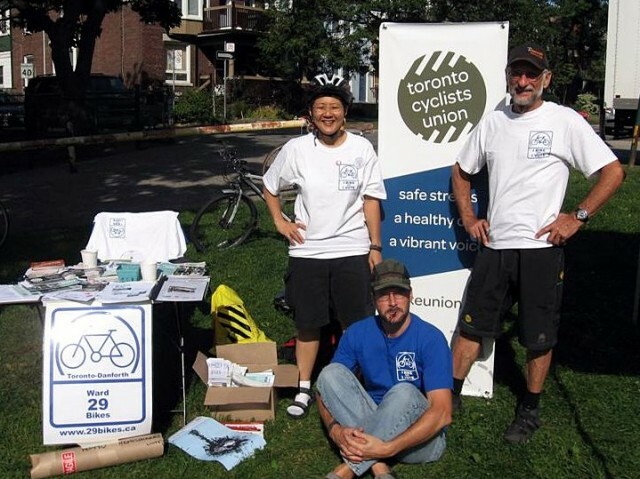 Ward 29 Bikes is a volunteer collective. If you like the work we do and would like to get involved, we encourage you to attend one of our meetings. There are many ways to help out, including using social media, staffing information tables a few times/year, bringing good ideas to our cafe discussions, or just showing up and having fun. A big “Thank you!” to all of the volunteers , past and present, who have established our direction, organized and participated in our events, and provided invaluable assistance in ways too numerous to mention. Making a difference in Ward 29 starts with you. I’m interested in attending your next meeting to find out more about your organization.